When I quit my day job to pursue a career in food, it was the climax of the recession. Leeman brothers had just collapsed. My friends were getting laid off left and right. And even my parents, who as freelancers had never received a consistent corporate paycheck in their lives, were anxious about this decision. I had a book deal, but no plan as to how I was going to make a living. 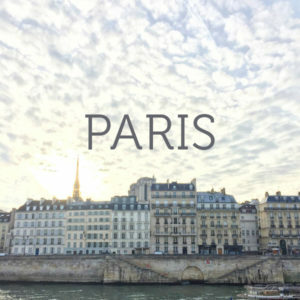 Usually it takes first time authors a few months in to realize that book writing is not going to pay the bills (just listen to this podcast). All I had to do was learn the amount of my first advance check to know it wouldn’t go far. Despite the climate of uncertainty, in my day-to-day life and that of the world at large, I wasn’t too concerned. Sure, I had a safety net if I didn’t get my act together. Those same freelancing parents lived just 40 blocks north, and happened to have a second bedroom that was still decorated with collages of Got Milk? Ads and Jonathan Taylor Thomas. But looking back, I’m still struck by my confidence and optimism. Because these days, and every day as I get older, risks feel so much riskier. Sometimes I think the advice I would give my 22-year-old self today would be far less valuable than the advice my 22-year-old self would give me: to relax, hustle and enjoy the ride. Fake it ‘til you make it. And since who knows when that will be (potentially, as far as my own judgement is concerned, never), keep faking it some more. This was the advice that I doled out regularly in my mid-twenties to other food babes coming up in the ranks. And I remember very distinctly the conversation in which I gave it to my friend Christina Lane. She had just gotten her first cookbook deal and was considering leaving her day job. (Or, at least, that’s what I think…correct me if I’m wrong Christina!). Someone had asked her if she’d consider doing weekly meal prep for their family. And not being sure whether a blogger who’d never gone to cooking school could honestly start a side job as a private chef, Christina called up another food blogger she knew who’d never gone to cooking school and had learned to make a living as a private chef. Using classic recession resilience, I quickly created my own smattering of opportunities in the gig economy. You can learn more about some of the odd food jobs I tried, here. But the best one, which I worked until just a year ago, was private chef-ing for a family. It gave me a steady weekly paycheck that allowed me to pay my rent on time, and prevented me from having to move back in with my parents uptown for more than a few months (yes, it still happened). Though I felt like a phony half of the time on the job, I had no scruples about learning on someone else’s dime. Private chef-ing, in the comfort of someone’s home was a much safer environment to gather new skills than a restaurant kitchen, where it would have been harder to google how to make a Christmas goose for the first time and watch a YouTube video about carving it while the guests enjoyed their appetizers in the other room. This was the pep talk I gave Christina, and I’d like to hope that it in some small way it gave her the confidence to take a leap into the unknown. Lucky for her (and the rest of us), private chef-ing was only a small stepping stone. Now she’s a badass (two time!) bestselling author, and one of my personal blog babe heroes. 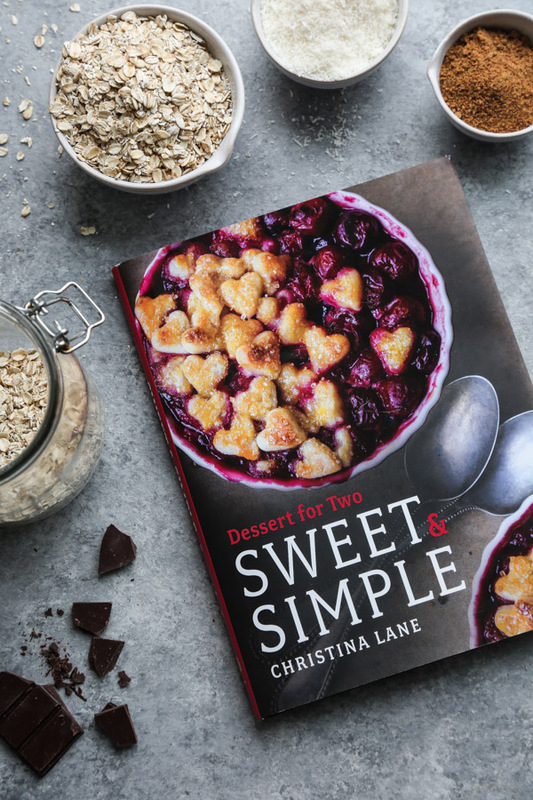 As of a few weeks ago, Christina welcomed her third book baby into her family of small batch desserts and dinners, and it just might be her best one yet. 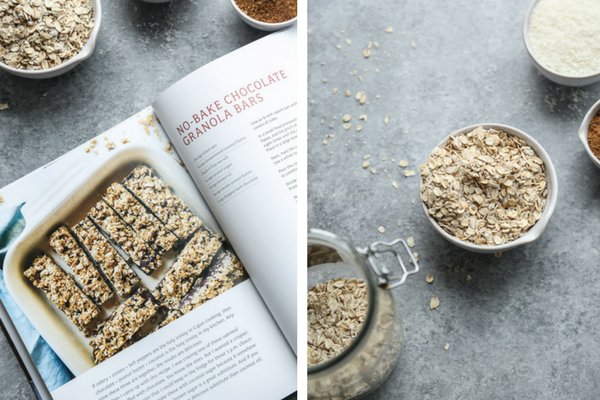 Today’s no bake chocolate peanut butter granola bars recipe comes by way of the Sweet & Simple cookbook. 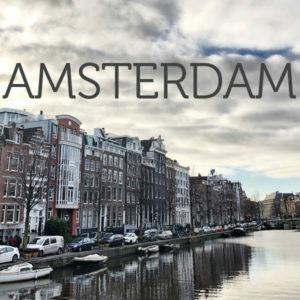 It’s organized by pan (genius!) 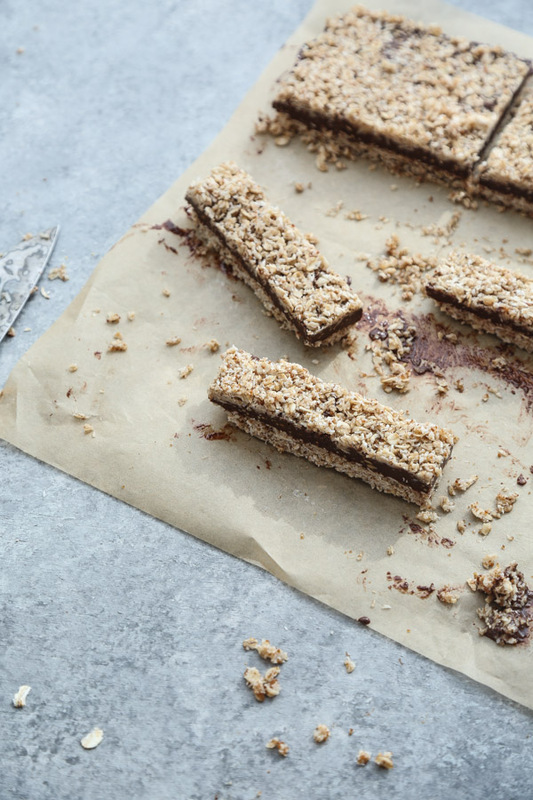 and these beauties come together in ten minutes using just an 8×8 dish (no baking required). When I first turned out the gluten-free oat and coconut mixture into my pan, I thought there was absolutely no way it was going to harden enough to make it from the plate to my mouth in one piece. 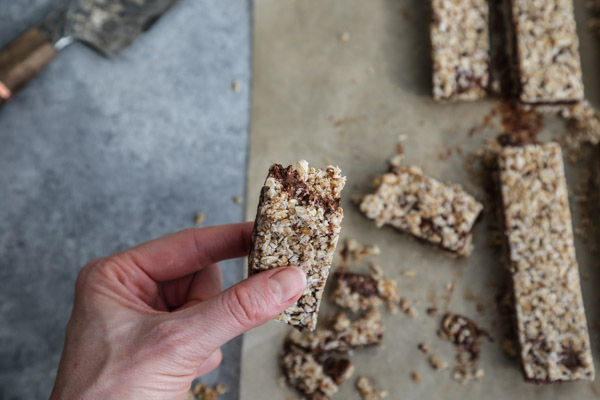 But Christina channeled the magical power of coconut oil, which hardens when cold, to solidify the oat crumble, and add a lot of healthy hormone-balancing fats in the process. The thick smear of melted peanut butter chocolate in the middle of the two oat layers didn’t hurt either. Since my palette is much more sensitive now post-elimination diet, I cut the coconut sugar quantity in half and found it was plenty. I also used the darkest chocolate I could find (70 percent cacao). 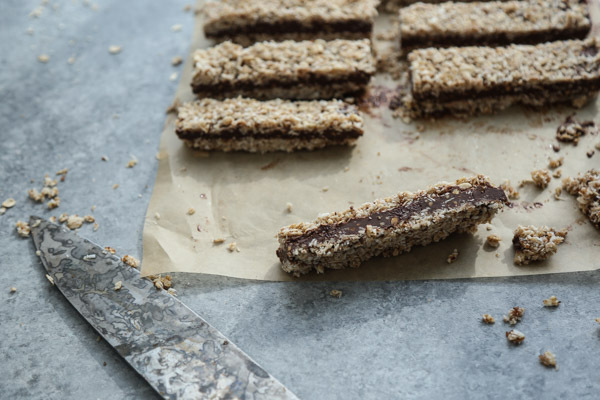 The bars keep in the fridge for up to two weeks, if you can resist their deliciousness for that long, and they’re a perfect daily treat after a meal, or a slightly more indulgent breakfast for us healthy hedonists. 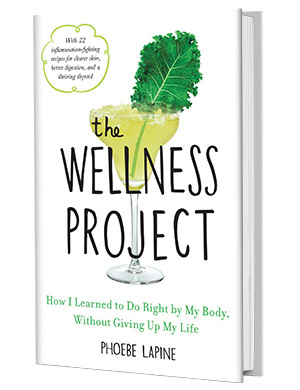 As the pub date for The Wellness Project draws nearer, I’m more in need of a confidence boost from my 22-year-old self than ever. And any mounting insecurity always makes the comparison game that much more destructive. I’m certainly not immune. But I can genuinely say that when the people you respect and admire, who have been with you on the same wacky freelance path, find success, it can be just the right kind of pep talk if you let it. I couldn’t be prouder of my friend and her latest accomplishment, or excited to share the chocolate-doused fruits of her labor! Keep faking it friends! I’m right there with you. 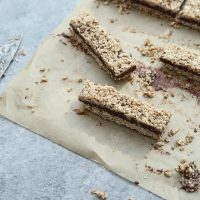 These no bake peanut butter granola bars, adapted from Christina Lane's cookbook Sweet & Simple are layered with gluten-free rolled oats, flaked coconut and dark chocolate. 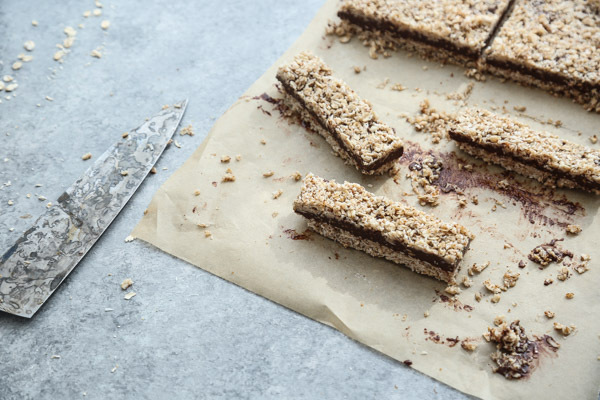 The recipe uses hormone healthy coconut oil to harden them and coconut sugar for sweetness. Since my palette is fairly sensitive at this point, I only used half of the sugar called for and felt it was plenty. You do you! In a small food processor, add the oats, coconut and a pinch of salt. Pulse about seven or eight times until the oats are broken down and coarsely ground. Transfer to a large bowl. Next, melt the coconut sugar into the coconut oil in a microwave safe bowl (about 20 seconds). Pour the coconut oil mixture over the oats and stir to combine. Divide the oat mixture in half and press half of it firmly into the bottom of the pan. Next, in a microwave-safe bowl, combine the peanut butter and dark chocolate. Heat at 50 percent power, stopping every 30 seconds to stir. Remove the bowl from the microwave before everything is totally melted, about 90 seconds total. Let rest on the counter, stirring occasionally until smooth. 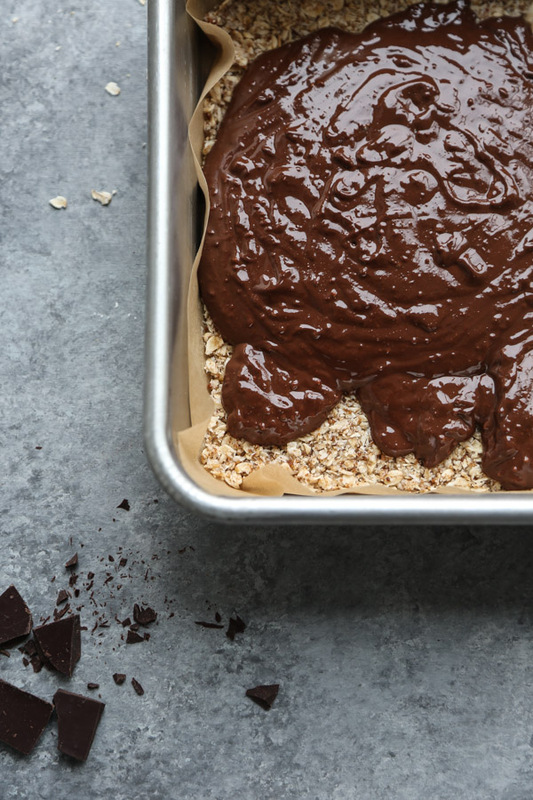 Pour the chocolate-peanut butter mixture on top of the crust, then sprinkle the remaining oat mixture over that. Cover and refrigerate for at least 4 hours, or until firm. 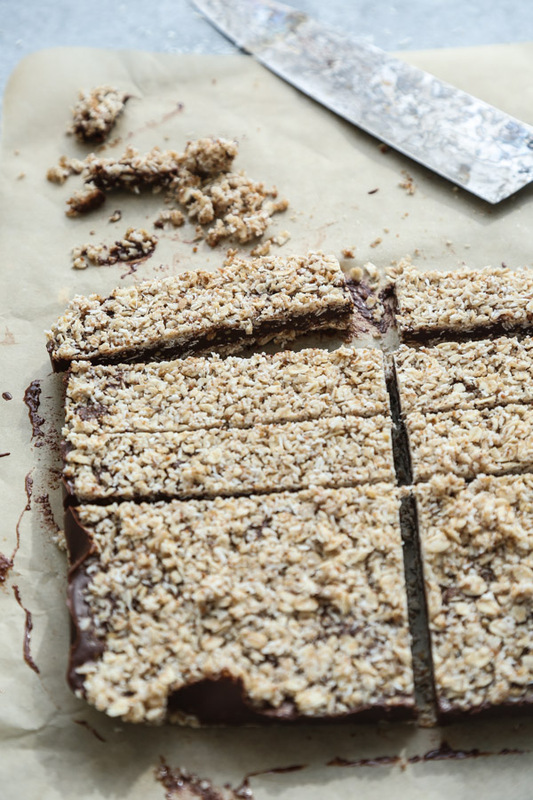 Store these bars in the fridge for up to 2 weeks. i have following her journey for a long and im so incredibly proud of her. i have not made this bar from her blog but i will now for sure!! i have that debate on full time cushy job vs freelancing every single day…havent been made to make a decision because like you said, as i grow older taking risk seems risker. These were really delicious and RICH. I think next time I will make more crust and less filling to make them a little less rich. Also I agree that a 1/4 cup sugar is enough. Thanks for sharing this recipe.